A few years ago, I sat smirking holding my father over a barrel, while playing a fiercely contested game of chess. I had calculated that within 3 to 5 moves the game would be over. Checkmate ! So I thought. What I didn’t realise was that my father was toying with me. Suddenly I was on the back foot and within three moves it was over. My father had beaten me convincingly. Damn you Chess! Ever since I was a kid, I saw the chessboard as a battlefield where two armies fought and the aim being to trap the other army’s king and capture their kingdom. For over 1,500 years chess has been played like this by kings, nobles, wise men and enthusiasts . In all honesty, you either love or hate it. There is no middle ground when it comes to chess. It is one of those games that can never be truly mastered (so they say) and arguably, that is why people are still fascinated by it today. Chess originated in the ancient Gupta Empire in India around the 6th century AD. One of its marvelous creations was a game called chaturanga, which was the first common ancestor of modern Chess. Unfortunately, we do not know much about how the game was played or its exact rules, except that like Chess, the aim of chaturanga was to defeat your opponent’s king by enforcing a checkmate. Chaturanga was played on an uncheckered board with pieces that represented elements from their military make up, namely elephants, chariots, cavalry and infantry units. In our modern game, the bishops were once elephants, rooks were the racing chariots, knights were the cavalry and pawns were the foot soldiers or infantry. A real size replica of the 12th century Lewis chessmen. Chess was eventually spread by Silk Road traders and others into Persia from India around the 6th or 7th century AD. It is believed that Buddhist pilgrims also spread chaturanga into the Far East. Variations of the original game of chaturanga were first played in China and Korea and finally Japan. Back in the Middle East, the Persians fell in love with Chess and began to further develop its rules. (The Persians name for chaturanga changed to shatranj). Participates began to shout out Shah ! (King in Persian) and Shah Mat ! (the king is helpless). These animated interjections during the game were the beginnings of check and checkmate, when the king was under attack and the game was lost. 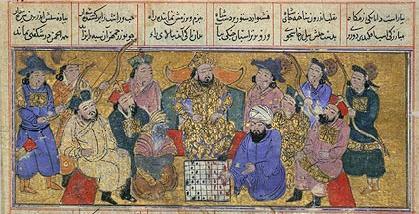 Persian manuscript,14th century, detailing how an ambassador from India brought chess to the Persian court. With the subsequent Muslim invasions of the 7th century, chess found a new participate. At first the Muslim largely kept all of the Persian pieces and their names. Shatranj would enjoy popularity throughout the Muslim world and eventually spread to Europe likely first through Muslim Spain. It also spread to Constantinople and the Byzantine Empire where it was called zatrikion. By the tenth century it had spread as far as Britain through to southern Europe. 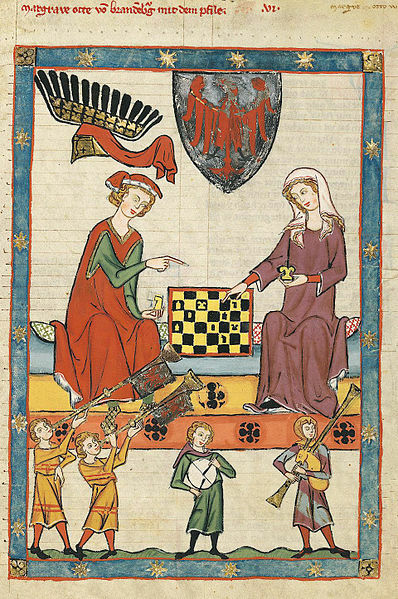 Margrave Otto IV of Brandenburg, depicted in the Codex Manesse playing chess. Nonrepresentational shapes were a feature of traditional Muslim chessmen as seen here. The evolution of the appearance of the chess piece also impacted on the popularity of chess. For insistence, Chess remained somewhat unpopular in Northern Europe likely because of the mundane appearance of chess piece that entered Europe. Ornate chess pieces and animal pieces that originally arrived with Indian traders and others gave way to Muslim abstract shapes. Muslims believed that these pieces promoted idolatry and chess piece were subsequently simplified into nonrepresentational shapes. Knights Templar playing chess. Apparently chess was one of seven skills a knight had to master. Between the 12th and 15th centuries chess grew in status and popularity. It was no more evident than in the social hierarchy of medieval western courts. Those who knew how to play the game even started to play for money, as early as the 13th century. Even the church tried to denounce it as an evil influence. Though, nothing it seems would stop the rise of this thinking man’s sport. It has been ackknowledged that chess, as a sport, was first staged as an international tournament in London 1851 and won by a German named Adolf Anderssen. However, in my research for this article, I came across an interesting story written by Boris Ivanov in his book A History of Chess, 1972, in which he retells a story about a tournament that was allegedly held three hundred years earlier in Constantinople. Unfortunately, there is no proof of this international tournament taking place, but it certainly sounds very charming if it really did occur. Not all chess champions are stuffy old men. This is Vesna Rozic, who was awarded with the Woman International Master title in 2006. She was two-time chess champion of Slovenia and participated in four Olympiads. Vesna only recently in 2013 lost her fight with cancer at the age of 26. Today chess is assessible to anyone who wishes to play it. It no longer remains a pastime of high nobility or brilliant minds. Occasionally I hear friends say I don’t know how to play chess or I will never get any better playing it. That’s not true. You will never know if you don’t give it a go. I also often hear people ask what does it take to be a good chess player ? Practice, practice, practice ! Furthermore, you don’t need special innate knowledge or an incredible analytical mind. Sure it helps, my father is brilliant at mathematics and problem solving, but you know what ? I cut him down to size just recently. Checkmate! Such a classic opening Lol! Thought I would get ya to play, guess not. Interesting, I had never thought about it but I would guess that India is the last place I would expect for the birthplace of Chess. Thanks for sharing. Just curious, have you ever heard of or tried the game of go? Chaturanga (India) was really the precursor to the chess the Persians developed. Some like to credit the Persians as founders of chess proper. They wouldn’t be wrong I guess? ‘Go’ originated in China, right? Never played it. Any good? Great article from Robert Horvat’s blog on the history of chess, which is a really interesting, surprisingly multi-cultural story of medieval history. Playing chess with a friend over a glass of wine is one of the great pleasures of life, and has evidently been so for many hundreds of years. A truly classical chess set would be great. Yes, elephant pieces and/or chariot rooks would be amazing.